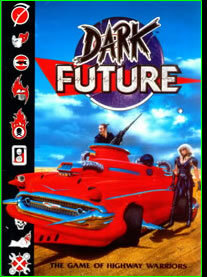 Hello to all new readers of Future Highways, the online magazine devoted to highway warriors of the Dark Future. Inside these pages you'll find information on the Dark Future of today, the Sanctioned Ops who keep the roads safe, the gangs who litter them with trash, the equipment that they use, the whys, the hows, the spills and the thrills. If you're new to Dark Future or Future Highways, then the Editorial is the place to start. This should give you a few pointers on what's what, and what's going on here. If you're an old hand, then step right up, insert your credit chip, and find out just what's happening on an interstate near you. As you might have noticed, Future Highways has been down for a while. This is due to continued disruption with present datanet providers. However, due to the generosity of Stig Rudeholm, Future Highways now has a new home for the time being. For being so gracious, we are happy to present Stig with an unlimited supply of chaingun ammunition* and a big thumbs up from the editorial team! Thanks Stig! Dark Future, White Line Fever, White Dwarf, 3-D Roleplay Hobby Game Citdel Miniatures are trademarks of Games Workshop Limited. Used here without permission. No challenge to their status is intended. Future Highways is copyright Francis Greenaway, 2004-2007. Future Highways was tested using Safari v3.0.4. *Limit of 1,000 rounds per year continuing for ten years or until Stig is no longer able to drive or operate heavy weapons.